When The Bathroom Studio Managing Director returned from the Laufen VIP pre-launch, he was emphatic about the positive direction this manufacturer is taking. This fourth generation range, using SaphirKeramik, allows for design scope that is unthinkable using standard ceramic; double washbasins in single washbasin sizes, washbasins with an integral overflow or freestanding washbasins with a minimal footprint. To develop the very best use of the design freedom SaphirKeramik offers, Laufen has been working with internationally celebrated designers. Throughout the development of this range, Laufen has, of course, maintained their responsible approach towards the impact on people and the environment because they recognise the rational use of water and recycling wastewater are fundamental to our future sustainability. Laufen has formalised this responsible approach by completing certification for the environmental quality of the complete ceramics range across all its Central European manufacturing plants in accordance with ISO14025, EN15804 and EN16578. 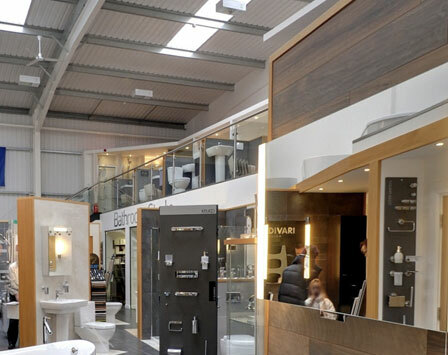 The Bathroom Studio, based in Evesham, Worcestershire has the largest Lauren product bathroom display showroom in the UK. The Bathroom Studio stock: LAUFEN, VILLEROY & BOCH, MATKI, HANSGROHE and many other brands. To develop the very best use of the design freedom SaphirKeramik offers, Lauren have been working with internationally celebrated designers.